This Aura Cacia car diffuser plugs into your car's lighter outlet and uses low levels of heat to volatilize the essential oils. Directions: Place 4-6 drops of any 100% pure Aura Cacia essential oil or blend onto the car diffuser pad. Slide the pad into the diffuser and plug into the lighter outlet. Provides aroma-therapeutic benefits for the mind, body and spirit for up to 3 hours. Remove the Aromatherapy Car Diffuser when not in use. For best results, use a new car diffuser pad when switching oils. Safety Notes: Warning: Avoid direct contact with saturated car diffuser pads to prevent possible skin irriation. Do not allow saturated car diffuser pads to come into contact with car interior. so much better than fake, heavy scented car air fresheners! you can add a drop or two of oil and it lasts for a week or more. i reuse the pads by keeping each one dedicated to certain scents. Works great. The fragrance lasts a long time! Works great and the pads can be reused a few times. Very effective. I hate regular car fresheners, because of the awful scents & chemicals. I was thrilled to see something natural that could actually benefit my health - aromatherapy. This little thing packs a punch. I recommend starting off with only 2 drops! Love how it goes into my car lighter spot instead of hanging or clipping to an inconvenient location too. I've used one pad several times and it's still good, so I think they'll last some time before needing to be replaced. I love using this diffuser while I commute to school! For the price I think it's great and I am able to reuse the pads a few times before replacing! Not what I expected. You need to put a lot of oil for your car to smell nice. The smell doesn't last long and it requires a lot of oil in order to even smell it. Not a fan! I received this as a gift and have enjoyed it everyday. I do wish it came with a few more refill filters as I enjoy changing the scents. It works as described but my unit slightly broke after falling once on the passenger side floor of my car. It was an easy fix (I just pressed it back together). I still recommend the car diffuser but beware of how delicate it is! I love this naturel smelling car freshener! Love this product!! Great way to get my essential oil fix!! Was happy to find this as an alternative to synthetic smelling car fresheners, especially since I now have a stash of essential oils I can use with this. I like it. My car smells amazing! It's small enough (cute, I would say). It's been a week and I found it last long enough. Works as expected. Essential oils are highly volatile and the scent dissipates quickly, so I add a couple of drops every day or two. I took off a star because the diffuser seems to be threatening to break -- the plastic parts of the ball don't line up properly anymore, after just a few weeks' use. Love this product! My car smelled nice for weeks before I had to add more oil to the pads. Great product. Not last long as I expected at all... after reading so many good reviews, it is a huge disappointment I have to say! Bought 2 of these, only one works. Disappointing, especially since they do not even work as well as the old Body Shop car freshener. I am allergic to most car fresheners. This alternative is awesome. Works great without any bad side effects. This is awesome product! I just need 2 or 3 drops of essential oil for over 2 hours fresh air. It's good for flu, cold, motion sickness, even happiness! This is a great idea, but I find it lacking application wise. I have found, so far, that I do not get much scent from it or for very long when I do. Now, it could just be the types of EO I've tried so far (although I do use quality oils). But I find it annoying that I have to reapply the oil so often, and its a pain to bring the oils with me as you shouldn't leave them in the car to be exposed to extremes in temperature. I love this. True, the smell does not last long (a few hours) but I keep a small bottle of oil in my car and just drop some on. It's great! Love it!! Finally a car freshener that works!! It's nice but the scent does not last long at all, I usually put about 3 drops of an essential oil on the pad and it lasts up to 3 hours so I find I have to put an oil on the pad every time I get into my car. Awesome product!! Just love it! I was really excited about this product since I love Aura Cacia's essential oils and I cut all unnatural products from my life but I'm finding that the scent isn't lasting and I have to put more oil on the pad each time I enter my truck. I'm still happy with my purchase, I just keep my oil in the vehicle now and put a few more drops before I start driving but I wish there was a way to make the scent last longer. I love this product. After a very long day at work I find the ride home relaxing as the aroma fills my vehicle. Works great, very happy I bought one. I bought one for my car and one for my husbands car. There is a lingering smell of cigarettes in his car from a fee years ago, (along with gym clothes, food, etc) so I gave him a woodsy oil blend that helps a lot. I use a calming blend with lavender and chamomile which seems to help my baby enjoy car rides more. Love this. My husband smokes in the car when I'm not with him so when I go out I always have this ready to go..smell of smoke doesn't last at all once it is plugged in. Great product! My car smell very well and it's natural! Love it! I have been looking for this product every where and was quite pleasantly surprised when I saw it here! It is a great and more environmentally friendly method of making your car smell great. I love it! Awesome product, makes the drive in traffic so much more bearable. 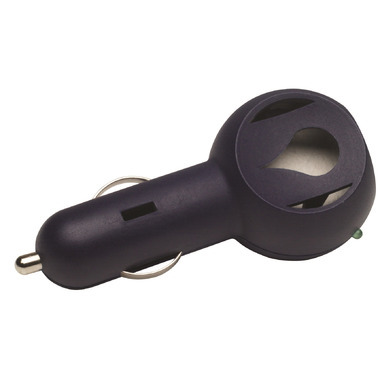 This is a great little product...fits in the glove compartment when not is use.. I use it primarily for my dogs, particularly for extended trips in the van. With the appropriate essential oil it has a nice calming effect of them.